Aleksei Alekseevich Brusilov (Russian: Алексе́й Алексе́евич Бруси́лов; 19 August [O.S. 31 August] 1853 – 17 March 1926) was a Russian general most noted for the development of new offensive tactics used in the 1916 Brusilov Offensive. The innovative and relatively successful tactics used were later copied by the Germans. Born into the aristocracy (his father was a general) Brusilov trained as a cavalry officer, but by 1914 he realized that cavalry was obsolescent in the new style of warfare because of its vulnerability to the machine gun and artillery. Historians portray him as the only Russian leader capable of winning major battles. However, his heavy casualties seriously weakened the Russian army, which was unable to replace its losses. His greatest achievement was the Brusilov offensive. He had a small numerical advantage (600,000 to 500,000), but in 72 hours advanced 50 miles, took 200,000 prisoners, and seized 700 heavy guns. His war memoirs were translated into English and published in 1930 as A Soldier's Notebook, 1914–1918. After the war he served with the Bolsheviks, and czarist historians avoided praising or even mentioning his historical roles. Brusilov was born in Tiflis (now Tbilisi, Georgia). His father was Russian, his mother, Anna Luiza Niestojemska, was Polish. Three generations of Brusilovs had served as officers in the tsar's army, his grandfather fighting in the defence against Napoleon's invasion of 1812. His father rose to the rank of Lieutenant General before dying of tuberculosis in 1856. Brusilov's mother died shortly afterwards, and the young orphan was raised by relatives in Kutaisi. He was educated at home until at the age of 14, he joined the Imperial Corps of Pages in Saint Petersburg in 1867. At the end of his first year, a tutor remarked of Brusilov, "his nature is brisk and even playful, but he is good, straight-forward and clean-living. Of high ability, but inclined to be lazy." In 1872, on completion of the Corps' programme, he sought admission to the advanced class for top ranking students, but was unsuccessful, and instead was posted as an ensign (Praporshchik) to the 15th (Tver) Dragoon Regiment. Usually, graduates from the Corps of Pages sought admission to one of the Guards regiments, but the Tver Dragoons were at that time stationed near Kutaisi, so the posting suited Brusilov on the basis of being near his family and being less financially draining than service in the Guards. Brusilov joined the Tver Dragoons in August 1872, and was given command of a troop, but it was not long before his aptitude resulted in appointment as regimental adjutant. He was promoted to lieutenant in 1874. Brusilov served with distinction in the Russo–Turkish War, 1877–78, being mentioned in despatches on three occasions. His unit operated on the Southern Front in the Caucasus, and took part in the assault of the fortress of Ardagan (now Ardahan, Turkey), for which Brusilov was awarded the Order of Saint Stanislav, 3rd Class. Later in the war, he also received the Order of Saint Anne, 3rd Class, and was promoted to the rank of Stabskapitän. Towards the end of the war, he led successful attacks on Turkish positions around Kars, and his membership of the Order of Saint Stanislav was elevated to 2nd Class. In 1881, Brusilov became a student at the Cavalry Officer School in St Petersburg and two years later was appointed as a riding instructor there. He spent the next thirteen years in a succession of posts at the school – Adjutant, Senior Teacher of Riding and Breaking Horses, Section Commander, Troop Commander, Squadron Commander and Assistant Chief of the School. On promotion to Major General in 1900, Brusilov was added to the list of Household Troops (officers who might be retained on official business by the Tsar). During this time, Brusilov married (1884), and the union produced a son in 1887. In 1908, he was appointed to command the XIV Corps in the Warsaw Military District, where his tenure was notable for the improvements in combat training he implemented. He also remarried at this time, to Nadejda ("Hope") Jelihovski. 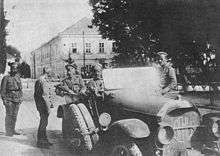 Promoted to General of Cavalry in 1912, he became Deputy Commander-in-Chief of forces in the Warsaw Military District. The failures of the Russo-Japanese War had led to allegations that Generals from immigrant families, who made a significant fraction of the Russian Army's senior ranks, were less patriotic than those who traced their origins to within Russia's borders, and Brusilov would come into conflict with the Governor-General in Warsaw, Georgi Skalon, and other "Russian-German" generals in that District. Brusilov was soon seeking another post. In July 1914, with the Russian army expanding during mobilisation, Brusilov was promoted to command the 8th Army, part of the Southwest Front operating in Galicia. The 8th Army crushed the Austro-Hungarian forces before it, and rapidly advanced nearly 150 kilometers (93 mi). Reverses elsewhere along the Front, including the great defeat at Tannenberg, forced the 8th Army to retire in conformance with the general Russian withdrawal. For his victories, Brusilov was awarded the Order of Saint George 4th, and then 3rd Class. By a quirk of fate, several future White Army commanders held senior posts in 8th Army at this time—Brusilov's Quartermaster general was Anton Denikin, while Alexey Kaledin commanded the 12th Cavalry Division and Lavr Kornilov was in command of 48th Infantry Division. In the early part of 1915, Brusilov again advanced, penetrating the Carpathian passes and entering the Hungarian plain. At this time, Nikolai II visited the 8th Army and Brusilov was promoted to the rank of General-Adjutant (in the Imperial Russian Army this was a "four-star" General rank). Once again, fortunes on other fronts would determine his actions and the Austrian-German breakthrough at Gorlice-Tarnów forced Brusilov to conform to the general retirement. By September, the 8th Army had withdrawn 180 kilometers (110 mi) to the Tarnopol region. Brusilov decided to distribute his attack over the entirety of Southwest Front. He hoped to disorganise the enemy over such a large area that some point would fatally give way. He decided not to waste resources by saturation bombardment of worthless areas, but to use interdiction fire against command posts, road networks, and other critically important targets to degrade German command and control over the whole front. The noted German artillery commander, Georg Bruchmüller, having served opposite Brusilov's Front at this time, would learn from and adapt these tactics when planning the preparatory bombardment for Operation Michael on the Western Front in 1918. Brusilov was not even concerned with securing a great local advantage in manpower, permitting Divisions under his command to be transferred to other Fronts (so long as they attacked in support of his offensive). Brusilov's new techniques were, by First World War standards, highly successful and over the next three months, Southwest Front advanced an average of more than 30 kilometres along a front of more than 400 kilometres (250 mi), taking 400,000 Austro-Hungarian prisoners in the process. However, the planned supporting attack from West Front (the Army group to Brusilov's north) was not delivered, and Germany was able to transfer 17 divisions from France and Belgium to halt the Russian advance. To increase the points of sally, thereby preventing a concentration of the enemy's strategic reserve. This approach aims to confuse the enemy by using several points of attack. To make the width of attack wide – greater than 30 kilometres. To limit the duration of bombardment – less than 5 hours. To advance the strategic reserve beforehand and to join with the storm troops after a breach of the enemy's front trench has been achieved. Not to avail cavalry. To get the trench lines as close as possible to the enemy's trenches prior to the battle. With the onset of revolution in Russia, Brusilov argued for the Tsar's abdication. When approached by Stavka for his opinion on the need for the abdication he replied, "... For the moment the only thing that matters is to stabilise our position to allow the continuation of the war with the external enemy... to abdicate in favour of Grand Duke Mikhail and a council of regents... It is necessary to hurry, the faster to extinguish the flames [of revolution], otherwise we face innumerable catastrophic consequences." Brusilov was torn by conflicting loyalties in the Revolution, and the Civil War that followed. His former soldiers were largely serving in the newly formed Red Army, and he concurred with the need for radical change, but as a conservative, patriot and monarchist his personal values were more in tune with those of the White faction. On 30 May 1920, during the Polish Eastern offensive of the Polish-Soviet War Brusilov published in Pravda an appeal entitled “To All Former Officers, Wherever They Might Be”, encouraging them to forgive past grievances and to join the Red Army. Brusilov considered it as a patriotic duty of all Russian officers to join hands with the Bolshevik government, that in his opinion was defending Russia against foreign invaders. Seventy when retired in 1924, he lived in his shared apartment with his sickly wife and another couple. He died in Moscow from congestive heart failure, and was given an honourable state funeral, buried in the Novodevichy Convent, by representatives from the 'new Russia' (the Bolsheviks), and the 'old Russia' (the clergy, the middle and upper class). His second wife Nadezhda Brusilova-Zhelikhova (1864–1938) is buried in the Orthodox section of the Olšany Cemetery in Prague, along with a number of other members of the Russian emigration. According to the assessment of British Field Marshal Bernard Montgomery, Brusilov was one of the seven outstanding fighting commanders of World War I, the others being Falkenhayn (later replaced by Hindenburg), Ludendorff, Mustafa Kemal, Plumer, Monash and Allenby. Wikimedia Commons has media related to Aleksei Brusilov. ↑ Вольдемар Николаевич Балязин (2007). Неофициальная история России [The Unofficial History of Russia] (in Russian). Olma Media Group. p. 595. ISBN 978-5-373-01229-4. Cockfield, Jamie H. "General Aleksei Brusilov and the Great Retreat, May–November 1915." Journal of Slavic Military Studies 26#4 (2013): 653-672. Higgins, David R. "Analysis: The Brusilov Offensive, 4 June-20 September 1916-Brusilov's offensive was the Russians' last chance to regain the strategic momentum on World War I's eastern front. Here's our analysis of why their effort failed." Strategy and Tactics 274 (2012): 38.